A cold-light transilluminator designed to quickly and safely find veins in neonatal, pediatric and general population patients. The Maxiscan® Model 1000 is a small, cordless transilluminator that boasts two settings; nominal and maximum light output. The healthcare professional can utilize the two settings to find the best contrast between organs and veins and the surrounding tissue. With the increased light output, finding veins is easy on a variety of patients, all while maintaining a low exit tip temperature at the lightpipe. As with all of our other models, the brilliant white light is peaked in the light spectrum for best contrast with the human eye. This unit has all the attributes of our other transilluminators: portability with internal rechargeable batteries, proven rugged and reliable design, but with the added benefit of having 40% more bright white light output than the Pediascan® Model 100 or Pediascan® Model 500. 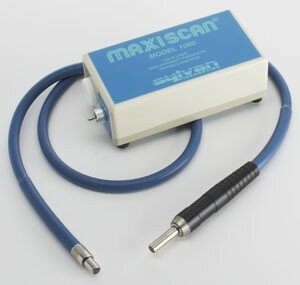 Each new Maxiscan® Model 1000 purchased include a K913 Battery Charger, a P101 Fiberoptic Lightpipe, and an Owners’ Manual / Service Manual. Request a quotation for the Maxiscan® Model 1000 neonatal transilluminator or contact us for more details.